WILLIAM BURDON. Taxed in the Subsidy Roll of Highampton in 1524’27. JOHN BURDON. Living at the time of Charles I.
ROBERT BURDON. Married to Agnes Kinge of Black Torrington. A window at Burdon bears the initials RB:AB and is dated 1569. JOHN BURDON. Married Joanna, daughter and co-heiress to her father, Roger Townslowe of Virginstowe. Roger Townslowe was listed in the Muster Roll of Virginstowe in 1569 and was described as a landowner and able man (an archer). John Burdon was the Plaintiff in a suit v Samuel Rolle and others concerning a tenement in Dolton. He died at Highampton on 20th October 1597. At his death, his estates consisted of Burdon and Down End in Highampton; Lake in Northlew; West Hill and Woodland in Black Torrington; Tenacre in Clawton; Southacombe in Holsworthy; Redhills, Noderton and Wythwted in Hatherleigh; and the manors of Odham and Pulworthy all in the county of Devon. He also had property in Cornwall. ROBERT BURDON. Married Alice, daughter of John Skeritt of South Tavistock. Robert Burdon was taxed in 1601 and 1613 in a rate levied for the maintenance of Highampton Church. He was Plaintiff in a suit v Richard Lippingcott and others concerning shares in the manors of Odham and Pelworthye, etc. Robert and Alice Burdon were defendants (1611) in a fine for land in St Stephen’s, Cornwall. In 1620 Robert Burdon signed the Herald’s Visitation of Devon. He was taxed in the Subsidy Roll of Highampton in 1624 and signed the Protestation Oath there in 1641. He died in 1655 and was buried in the churchyard on the 13th May. His Will dated the 20th September 1641 was proved the 30th January 1656’7. CAPTAIN JOHN BURDON. Born in 1600. Married his wife Elizabeth on the 17th April 1622. He signed the Protestation Oath in 1641. In a list sequestrations by Parliament dated the 6th April 1648, he was described as ‘a delinquent and poor and a captain in the Royalist army’. Captain Burdon is said to have died at the hands of Cromwell’s men without inheriting the estate. ROBERT BURDON. Born 1623. Named as the son and heir of his father, aged six years in 1629 (pedigree in possession of Rev Andrew Quick 1843). He was also named in the Will of his grandfather Robert Burdon 1654 and bequeathed a gold ring. Robert married his wife Jane, who was of royal blood being the 14th in descent from King Edward I, in 1664. Robert Burdon died in 1678 and was buried at Highampton on the 29th December. His wife died some seven years later and was also buried at Highampton on the 20th March 1682’3. JOHN BURDON. Born 25th August and baptised on the 19th September 1667 at Highampton. He married Margaret, the daughter of Thomas Coryndon of Winkleigh. ROBERT BURDON. Baptised 20th January 1691’2. Married his first wife Margaret, the daughter of John Palmer of Monkleigh, on the 10th October 1718’9. On the death of his first wife, Robert Burdon remarried, this time to his neighbouring widow Mrs Margaret Coham, second daughter and co-heiress of William Holland of Upcott Avenel, Sheepwash, and of Thorne, Holsworthy. CHARLES BURDON, the attorney (a younger brother to Robert) of Black Torrington was the next to administer the Burdon estate. He was born at Burdon and baptised at Highampton on the 12th August 1690. He acted as Steward of the Court of the Baron for the Hundred of Black Torrington in 1734. Charles Burdon married Elizabeth, daughter of Abraham Dennis, Esq., of Northleigh, in the parish of Inwardleigh who was a Justice of the Peace for the county. The marriage took place at Okehampton, Devon and the couple made their home at Black Torrington. John (a younger brother to Robert and Charles) was born at Highampton in 1694 and was apprenticed in 1712 to the goldsmith John Ellson of Exeter. He entered his mark in the Archives of the Exeter Goldsmiths’ Guild, BV crown ovci in octagon in 1719 and OS mark in 1720. He was admitted a Freeman of the City of Exeter on the 5th March 1722. John acted as bondsman in seven marriage allegations (a statement made on oath in order to obtain a marriage licence) relating to the years 1722-1734 including that of his brother Robert, 1734. Around 1740 he presented a silver chalice and paten to St Mary’s Church, Black Torrington. John Burdon married but died without issue and was buried on the 3rd January 1758’9 at Highampton. The elder brother, Charles, died on the 24th October 1753, aged 57, and was buried on the 24th October at Black Torrington. His wife Elizabeth had predeceased him and was buried at Black Torrington in 1748. The Burdon estate then passed to Charles Burdon’s elder son, also named Charles. CHARLES BURDON was born on the 29th May 1733 and baptised the following year at Black Torrington. Like his father, he became a lawyer. He was informant of an unofficial pedigree taken by Isaac Heard, Lancaster Herald and recorded in the College of Arms, London. He married Mary, daughter of William Rudd of Wear in the parish of Topsham, Devon. The marriage took place at St Paul’s, Exeter on the 15th May 1764. Charles Burdon lived to the age of 54. He was buried on the 21st January 1787 at Black Torrington. His wife survived him by a further nine years and was buried, also at Black Torrington, on the 24th June 1796. On the death of Charles Burdon, the ancient family home of Burdon at Highampton passed to his second son John Dennis Burdon (his eldest son Charles having, presumably, died in infancy). JOHN DENNIS BURDON of Burdon was born at Black Torrington and baptised there on the 2nd April 1679. His wife Elizabeth was baptised at West Cowes in Hampshire. The couple married at Black Torrington on the 6th October 1806 and spent the first years of their marriage at Upcott before he built the house now known as The Larches in Black Torrington. A rental of lands dated 1788 [Devon Records Office] list John Dennis Burdon’s properties as being in Black Torrington, Broadwood Kelly, Sheepwash, Highampton, Clawton, Virginstowe, Northlew, Bratton Clovelly, Hatherleigh, Germansweek and Halwill. As well as being a substantial landowner, he was also a magistrate for Devon. The couple were both named in the 1841 Census of Kenton, Devon, as living at South Town Villa where John Dennis Burdon died, at the age of 73, on the 4th February 1842. He was buried at Black Torrington (M.I. in church there records inaccurately blazoned Burdon arms impaling Rodd). His Will dated 5th March 1841 was proved the 19th April 1842. His wife Elizabeth Burdon died on the 9th Mary 1844, aged 59, at Southtown in her home county of Hampshire. Her Will, dated the 6th February 1842, was proved the 6th July 1844. CHARLES BURDON of Burdon was the eldest of John Dennis Burdon’s five sons (there were also eight daughters) and was baptised on the 18th July 1809 at Black Torrington. He married Penelope, daughter of Charles Kendell sometime of Lostwithiel, Cornwall. She was born at Broadhamstone in Devon, circa 1804, and died on the 25th January 1887. At the time of the 1851 census, Charles and Penelope Burdon were living at Burdon with a live-in servant by the name of Susan Bate. Next door, cultivating the Burdon home farm of some 600 acres, were John Guscutt and his family who employed three servants, namely Stephen Knight, Waggoner; David Lavis, Cattle Boy and Thurza Hawking, House Servant. It appears that the marriage between Charles and Penelope Burdon had become strained and his wife eventually separated from him. Her estranged husband was named in the 1861 Census of Coombe Poppard, Devon, as living at Park Villa. Charles Burdon was party to a conveyance dated the 21st November 1862 of the manor, farm and lands called Burdon and Down Ends (190 acres) for the sum of £3,400 to James Reddaway of Buckland Filleigh and Inwardleigh. It would seem that most of this money went to Penelope Burdon for when she died at Treganna Villas, Heavitree, Devon, she left a personal estate of £3,257. Charles Burdon was the last of the direct descendants of the family to own Burdon. After selling the family home, he moved to Wales to live where he associated with Mary Ann Squires who was named in his Will, dated the 20th February 1873 (with codicil dated the 5th November), as the mother of his reputed two children, Charles Browne and Ellen Browne. He was named in the 1872 Census of Thorpe St. Rhyl, where he was described as having income derived from interest of money and land. He died sp. legitima on the 10th February 1874 at Craynafa Terrace, Rhyl, aged 64. His Will was proved the 15th October 1880 and his estate was said to be under £20! JAMES REDDAWAY was the first ‘outsider’ to own Burdon after purchasing the manor, farm and lands from Charles Burdon. On taking over the property, the new Squire set about building himself a ‘pound house’ for making cider, using locally made red bricks and natural stone. To mark his achievement, he set a stone in the north gable of the building with his initials deeply engraved, showing the date 1863. This stone was later removed and re-set in the west elevation when the building was converted into living accommodation by the Thomases in 1982. Squire Reddaway died on the 12th March 1870 at the age of 62 years and was buried at Highampton. His burial place is clearly marked with a headstone and unusual half-barrel stone covering his grave. The Manor was acquired by the Thomases in 1982 when certain lands and sporting rights were purchased while they were still in ownership of the Grade II listed manor house, namely Burdon Grange. These special rights, known as ‘profits à prendre’, allow them and their successors in title the privilege to pursue country sports in, over and upon other people’s specific property in the neighbourhood. The Lordship of the Manor of Burdon is currently held by Maurice Thomas. He is a founder member of the Highampton Local History Group and was elected its first Chairman in April 2009. In his book, The Manor of Burdon - Its Lords & Successors, Maurice Thomas states that the ancient manor of Burdon is reputed to be one of the oldest in the county, going back to the Anglo-Saxon period. 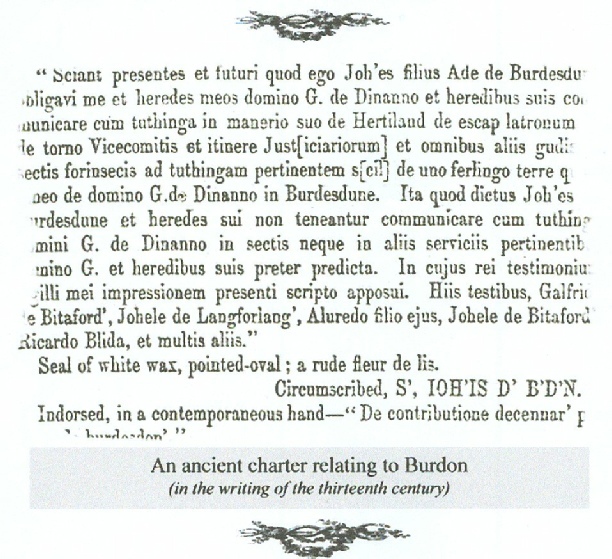 Burdon, or Buredune, as it was known at the time of William the Conqueror’s Domesday Book, was later held by Lucya de Buredone in 1241 for one-tenth of a Knight’s fee (Testa 458 180a). In 1301’3 it was held by the heir of Roger Cally (Feudal Aids 357). It is also shown that Roger de Burdon was assessed for 10d tax at Heaunton [Highampton] in the Devon Lay Subsidy of 1332. It also appears among the fees held of Hugh Courtney in 1377. The seventeenth century historian, Thomas Westcott, on compiling his account of Devonshire in 1630 remarks that “Baverdon, alias Burydon, now Bourden, hath here a fair demesne of his name and is very ancient”. In fact, the Burdon family had already held sway over the Lordship of the Manor of Burdon from as far back as Richard I and they continued to do so for another 232 years after Westcott’s observations. From the Burdon pedigree it can be seen that some thirteen generations of the family had held the manor from the time of Henry VIII to the reign of Queen Victoria when James Reddaway bought it from Charles Burdon in 1862.